How Anchoring Bias affects your Financial Decisions? In my last article we saw that while taking our financial decisions mostly we react emotionally. We also discussed left brain: right brain theory as well as System 1 and system 2 theory given by Danial Kahneman. In this article I want to discuss Anchoring Bias which affects our decision making. Let us discuss Anchoring Bias in detail. Anchoring is a cognitive bias that describes the common human tendency to rely too heavily on the first piece of information offered (the “anchor”) when making decisions. During decision making, anchoring occurs when individuals get anchored to initial piece of information or some number to make subsequent judgments. For example, if you want to take a cable connection at your house and have asked my opinion about ABC cable company and I gave you a bad review about that company and told you that there are lots of complaints against this company and you can check online. Now what will you search on Google, “complaints about ABC Cable company” so here you are anchored to first piece of information. Ideally you should search for “ABC cable company reviews”. There is common tendency in humans that they give more importance to first piece of information while making decisions. Anchoring bias works more while we have to decide number. In 1974 Kahneman and Tversky two psychologist conducted a study where a wheel containing the numbers 1 to 100 was there and participants in the study had to spin the wheel and see what number comes on the wheel. Once they spun the wheel and got one number they were asked that whether the percentage of U.N. membership accounted for by African countries was higher or lower than the number on the wheel. Afterwards, the participants were asked to give an estimate. Tversky and Kahneman found that the anchoring value of the number on the wheel had a pronounced effect on the answers given by individuals. When the wheel landed on 10, the average estimate given by the subjects was 25%. When the wheel landed on 60, the average estimate was 45%. The random number had an “anchoring” effect, pulling individual participants estimates closer to the number they were shown even though the number had zero correlation to the question. One more aspect of anchoring is individuals try to find some anchor while giving answer of a question. For example, if I ask you in which year Gandhiji was born? Now observe how you think and answer my question. Immediately you go back to 1947 and then think that at that time Gandhiji looked around 65 to 70 years old and will answer somewhere near 1880 or 1885. So while thinking this you took 1947 as an anchor and then tried to find answer by deducting Gandhiji’s approximate age. So this is also anchoring effect. 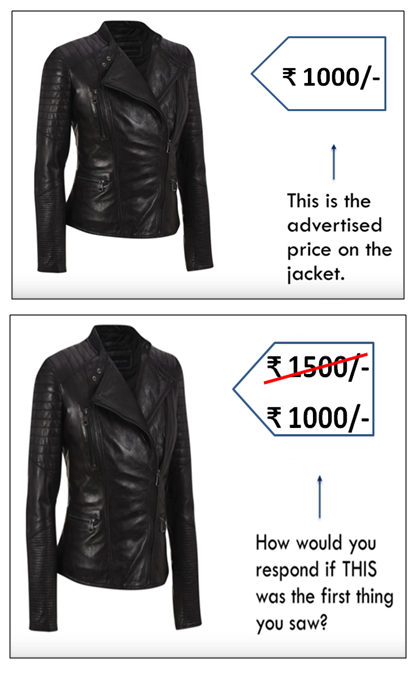 Suppose you are in a market for shopping and you come across a jacket shown in picture which has a price tag of Rs. 1000. Now you like this jacket and want to purchase it so what price will you quote to negotiate? And if the same jacket had a price tag of Rs.1000 after deleting tag of Rs.1500 stating discount Rs. 500 as shown in second image what price will you quote now? In first case when price tag was directly Rs. 1000 most of us will negotiate and quote below Rs. 1000 as per our understanding of fair value but in second case most of us would not negotiate at all thinking that the jacket price is already Rs. 1500 and has offered a discount of Rs. 500 so this is the bottom price. Here in first case Rs. 1000 tag was there so that number became an anchor and in second case first number that was given was Rs. 1500 so that became anchor and we were ready to pay more easily even though in both cases jacket was same and it had not changed value offered in the form of jacket. Isn’t this very common in India? This is a very commonly used pricing policy. One more example of this is property dealings. If you are negotiating for property with someone and when either buyer or seller speaks some figure then that figure becomes an anchor and negotiations happen around it. For example, if you are selling a house and discussing price with a prospective buyer and you have decided in your mind that you will not sell this house below Rs. 55 Lakhs. If while negotiating price you first put the figure of Rs. 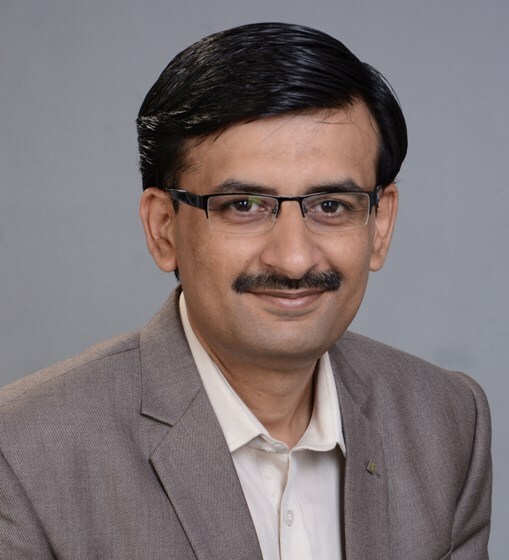 55 Lakhs, then discussion will happen around it and the buyer will put some figure less than 55 Lakhs and matter will generally settle somewhere close to 50 to 55 lakhs. But if you first put figure of Rs. 60 Lakhs then discussion will happen around Rs. 60 lakhs and there are high chances that you will get around 55 lakhs. So in first case when you put 55 lakhs directly the anchor is 55 Lakhs but in second case when you put 60 lakhs you put a higher anchor. 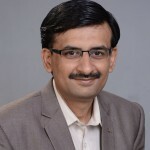 Let us take this example further suppose you are a buyer and someone puts a figure of 60 lakhs then both the parties will anchor to that figure but if you want to get out of that anchoring effect then immediately make a big loud dramatic voice and show him like you are shocked with that higher figure, this will help to erase the effect of that number and you will be able to move discussion to another number easily. Another way is to ask many small questions around that number, asking the other party to justify that number. Both these approaches will help you to erase anchoring effect of that first spoken number. 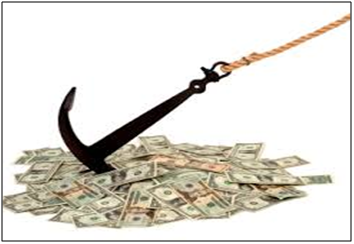 Now as this topic is very long we will continue in next month article with How anchoring affects our financial decisions? and How to get out of it while making financial decisions? « How Psychology plays an important Role in your Financial Decisions?